Japan continues not to disappoint in the Things No One Asked For department. After decades of giving us forward-thinking transportation - from the iconic Akira motorcycle to the Shinkansen, Japan's high-speed rail system of bullet trains - the country of big ideas and small capsule hotels has surpassed any previous inanity with the poop bike. Crowned by a porcelain toilet rather than an actual seat, this tricycle and motorbike hybrid uses animal waste and sewage for fuel, thankfully, and not the human variety. 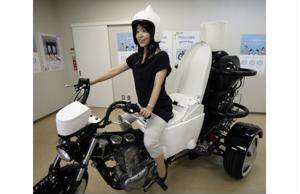 "The biogas it uses as fuel is not made from human waste," Kenji Fujita, company spokesman for TOTO - the bathroom giant behind this motorized toilet - told Japanese reporters. "It's made from livestock waste and sewage." That still doesn't explain the purpose of the giant roll of toilet paper affixed above the bike's motor. It's not quite as classy as a Jaguar hood ornament, but it certainly clears up any confusion those sharing the road might have about whether it is indeed a toilet you are riding on. TOTO's no slouch in the world of bathroom fixtures, however. As designers of premier porcelain thrones, the company has expertise in everything from bidet seats and washlets to toilets that play music for you (potentially even "Africa"). So where's the green in this motorbike that TOTO, according to England's The Sun, has no plans to commercialize or sell? Behind all the inherent silliness and grandiosity involved in the poop bike's design, Fujita assured the crowd that there was much more to this venture than what meets the eye. "We hope to raise awareness among customers about our green campaign through development of environmentally-friendly products such as water-saving showerheads and water-saving toilets," Fujita told reporters. To cover the stats - the oversize tricycle is actually called the Toilet Bike Neo, the suffix implying there will be more models. It also runs on a 250 cubic centimeter motor, which places it in the realm of your average motorcycle should these ever go into production. Outfitted with a toothbrush holder and working shower head, there's no reason this shouldn't be a hit on America's highways. And if you haven't had your fill of this awkwardly green bike, run a YouTube search for its Japanese ad, which has quirk enough to sell a fleet of Toilet Bike Neos.